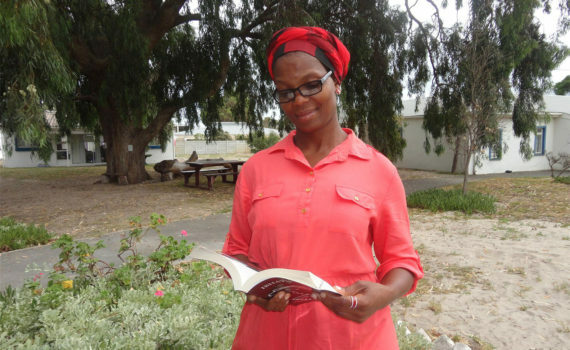 For months Betty an 2014 Evangeline graduate has been asking me for a Xhosa Bible. 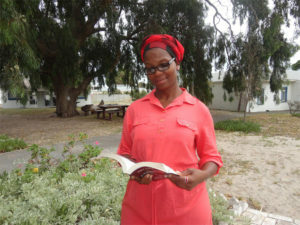 Up until last year, I asked students to choose whether they wanted a Xhosa or English Bible. As well I have purchased Bibles in the Soto language and also had a French Bible donated. Currently, we use English bibles to strengthen their English. A few weeks ago when I purchased the English Bibles, the Holy Spirit reminded me about Betty’s request. Betty caught up with me this week and again asked if I remembered to purchase the Bible. Yes, I said and opened out locker to give it t her. She let out a cry of pure joy that just filled my heart. “Now I can read my Bible every day and in church.” She had also run right to the sewing room and was reading it to others. When I asked where her English Bible was she said her son had taken it and he too is reading the Bible.